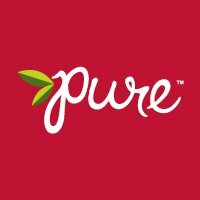 Pure Bar’s nutritious and delicious bites are made with organic, gluten free, non-GMO ingredients for worry-free, healthy snacking. 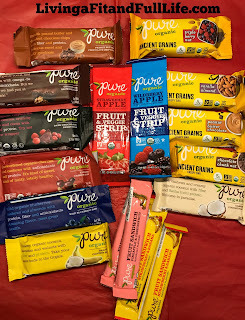 Loaded with wholesome, natural ingredients like fruits, nuts, and whole grains, and luscious elements like chocolate, vanilla and nut butters, Pure Bar products are pure joy. Whatever you crave a healthy bar made from fruits and nuts, or ancient grains, a crispy-crunchy bite-size snack, or a chewy and sweet fruit treat Pure Bar delivers delicious high-energy snacks with fiber and protein. We believe you shouldn’t have to compromise taste for nutrition. All of our healthy snack foods are made without artificial flavors, or colors. USDA-certified organic, GMO-free, Gluten-free, Soy-free, Dairy-free, Vegan, Certified Kosher. Balanced nutrition just as Mother Nature intended. Pure Chocolate Brownie bars are certified organic, non GMO, vegan, gluten-free, soy free, kosher and made with dark cocoa, and rich walnuts. Pure Banana Coconut bars are certified organic, non GMO, vegan, gluten-free , soy free, kosher and made with creamy coconut, sweet bananas and rich walnuts. Pure Chocolate Chunk Nut bars are certified organic, non GMO, vegan, gluten-free, soy free, kosher and made with delicious nuts, rich chocolate and our exclusive crispy Ancient Grains blend. Pure Vanilla Almond bars are certified organic, non GMO, vegan, gluten free, soy free, kosher and made with creamy vanilla, rich almonds, and our exclusive crispy Ancient Grains blend. Pure Triple Berry Nut bars are certified organic, non GMO, vegan, gluten-free, soy free, kosher and made with blueberries, raspberries, cranberries and our exclusive Ancient Grains blend. Pure Organic is clean, nutritionally balanced, delicious food for all ages! Truly it is! My entire family loves all the snack options from Pure Organic. My kids love the Pure Fruit and Veggie strips and Fruit Sandwiches and actually chose them over gummy bears the other day which is something that makes this mom of 4 pretty proud. I absolutely love that they're made with real ingredients. Having tried them myself I have to say that they really are quite delicious and could easily satisfy my sweet tooth when I'm craving something sweet. My husband is a huge fan of Pure Organic's Fruit and Nut Bars as well as their Ancient Grain Bars. He's always running late in the mornings and has very little time for breakfast so he's always on the hunt for something quick to eat that's clean, nutritionally balanced and delicious which is exactly what these bars are. I was able to snag a few to try as well and absolutely loved them. The flavors are amazing and satisfy my hunger for hours. My kiddos also love them! I'll definitely be buying more of these Pure Organic snacks to keep on hand for busy mornings, car rides and general snacking as they're the perfect clean snacks for the entire family!